What is responsibility centre management? The stewardship of resources is a key responsibility of every publicly-funded organization. For several years, we have actively been working on the new resource allocation process for the University of Saskatchewan: responsibility centre management will support our academic mission and vision, our values of collaboration and connectivity, and the implementation of our strategic plans. The coming year will be an exciting time in the university’s history. Working together, we will establish a renewed strategy and goals for the University of Saskatchewan, and all of our colleges and units. The mission of the planning office, and my commitment to you is that we will guide a continuously-relevant, evidence-based, planning process which will lead to an aligned and appropriately resourced university. Our vision is that the collaborative process of institutional planning, and the plan itself, will result in renewed energy, focus, pride and momentum internally, and greater impact, reputation and support externally for the University of Saskatchewan. I trust you will find the information and tools you need here, and I encourage you to contact our office if you have any questions. Responsibility centre management is a process that empowers our academic and non-academic leaders to manage their own revenues and expenses. Placing resource decisions closest to the locale where they are put into practice improves both decisions and outcomes. In addition to budgetary authority, responsibility and accountability is also placed at the local level. An appropriate level of central governance and controls ensures ongoing alignment with institution-level values, priorities and fiduciary obligations. This process best aligns the institution to meet goals set out in the vision, mission, and values and expressed in our institutional plans. Through the resource allocation process, responsibility centre management assigns revenues to the units based on activity metrics. The university retains some funds centrally for flexibility and to reach institutional goals. 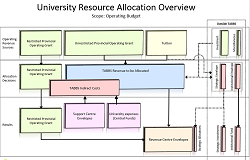 Resource allocation is a decision-making process whereby the university’s resources are assigned. Financial authority is aligned with university governance structures, decision-making authority, and management is accountable for their use. In moving to an responsibility centre management model, the university must intentionally design structures, policies, practices, and processes to ensure the new model will fit with the organizational culture and strategic priorities. This in turn will enable the alignment of resources behind strategic plans, both institutionally, and at the college/unit level. The university began the process of improving the resource allocation model in 2007/08, with the second integrated plan. 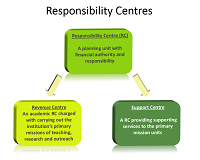 Responsibility centre management has now been adopted as our resource allocation model. The ongoing work includes refinement of the transparent, activity-based budget system (TABBS). 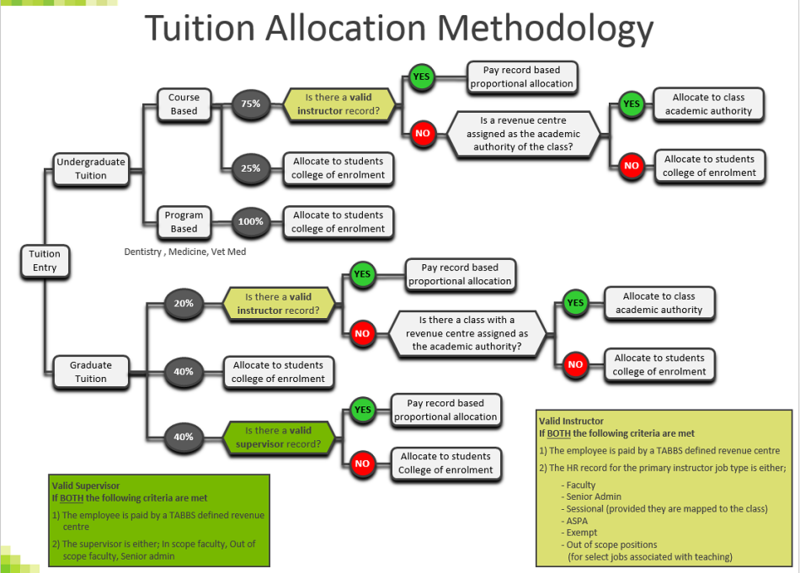 The transparent, activity-based budget system (TABBS) is the university’s allocation model. The current model attributes operating revenues and costs to the units that generate them. This creates a “full-cost” view of revenue generating operations. The TABBS model data is updated annually to reflect changes in activity levels, tuition revenues and government funding. The university plans to have ongoing reviews of the TABBS model to ensure the incentives in the model align with plans and priorities, and to ensure the information regarding costs continues to be reliable. Responsibility centres: divide the organization’s planning units into revenue and cost centres responsible for financial decisions delegated to the most appropriate local level of the organization. Revenue centres (RC): academic responsibility centres charged with carrying out the institution's primary missions of teaching, research, and outreach (i.e. colleges and schools). Support centres (SC): responsibility centres providing supporting services to the primary mission units (i.e. administrative units). University funds: common goods/services managed on behalf of the institution by various units across campus but which are distinct from the responsible unit’s operational expenses/envelopes. Service unit: sub-sets within the operations of a responsibility centre that offer a specific service within the responsibility centre (i.e. Gwenna Moss within VP T&L). Envelope funding: the allocation of operating funding to a responsibility centre as a single line item (i.e. in an “envelope”) managed directly by the responsibility centre. Transparent Activity-Based Budget System (TABBS): a model developed at the U of S which informs the allocation of operating budget revenues and costs to responsibility centres. Unrestricted provincial operating grant: base funding from the Government of Saskatchewan that supports general university operations. Restricted provincial operating grant: funding from the Government of Saskatchewan that has financial restrictions on the use of the funds. For example, funding provided from multiple provinces to the Western College of Veterinary Medicine in accordance with the inter-provincial agreement. Indirect costs: the cost of support centre envelopes and central funds which are included in TABBS and assigned to revenue centres. “Hold neutral”: the relative percentage of the total unrestricted provincial operating grant required that keeps a revenue centre envelope at its historic level in the baseline year. Baseline year: the year that a component of TABBS is introduced into responsibility centre envelope calculations.